Depth: 1/4-1/2" Tip: Nick or file the seed coat prior to soaking seeds in warm water for 24 hours prior to sowing. Starting Indoors: Sow in pots about 4 weeks before planting out after last frost. Keep at 65-80°F. Cover with plastic to retain moisture until germination occurs. Starting Outdoors: Direct sow about two weeks after last frost. Vintage flowers of brilliant cherry red open mornings and stay decorative throughout the day with fluffy doubled petals. Plant: Bright green heart-shaped leaves on green vines. Seeds: These double bloomers do not produce seeds. 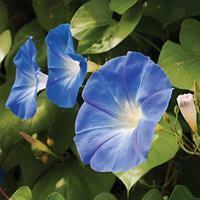 The Ipomoea genus consists of about 4-5oo species.